Once the home of the de Havilland Aircraft Company (DHAC), Hawker Siddeley and British Aerospace, Hatfield has been the point where many famous aircraft first left the earth and took to the skies for the very first time. Other famous prototype aircraft have visited to take part in airshows and demonstrations. Many aircraft – including some belonging to the Airspeed stable – were made here. These days, aviation in Hatfield is largely over-flights. Below are just a few of the planes, rockets and missiles that made Hatfield famous (in alphabetical order). Please note: entries on this page are links to information published in other sections of the site, so you will probably need to use your browser 'Back' button to return to this page. 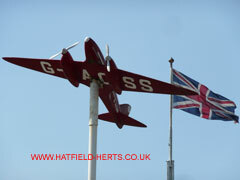 Some very brief information on Hatfield's aerospace history can be found under Claims to Fame. Statistics on the aircraft produced at Hatfield were published in the feature: Hatfield during WWII. The DH.106 Comet jet airliner was Britain's (and the world's) first commercial jet airliner. This Hatfield plane was also literally at the head of France's first passenger jet aircraft, the Sud-Est SE.210 Caravelle. Aircraft design, manufacturing and servicing may have ceased but the groundbreaking work done at Hatfield lives on in the skies above. New aircraft come to life from the drawing board (these days computer screens) when the first aircraft – the prototype – is built and tested. Here all the multitude of components and systems will come together, and tweaked before mass production can start. Hatfield has played host to many prototypes from many famous makers.